E.J. is participating in the October Trix-n-Treatz event at vvb32 reads with a new short story piece themed Alice in Wereland. Take a trip down the wererabbit hole with Alice...you may be surprised who she encounters. 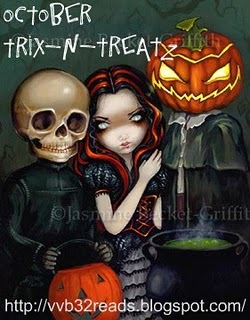 Have you joined in the fabulous October Trix-n-Treatz festivities at vvb32 reads? Check out the full schedule of events for information on giveaways and guest features. While visiting vvb32 reads be sure to take the Get Spooky Challenge and enter for a chance to win a copy of She Smells the Dead ! I love her blog, it is a great contest,too. I loved the short, and of course I have been a proud VV follower for some time. Kudos again on the werecat!